You love your car. You live to drive it, to look at it. Whenever you park it, you take a few steps and stop. Why did you stop? Because you want to throw another look towards your car. This should apply to all people that service and maintain their own car. They should take care of it and love it. But you know what’s also important? Keeping the engine lubricated and running smoothly. There’s no point in being all show and no go. Therefore, this time we’re taking a look at oil filters, so we can decide which one is the best oil filter for synthetic oil. When it comes to oils and lubricants, there are a few companies that made their mark in the automotive world. One of those is Mobil1. They’ve proven their worth both on the track and on the street, with their lubricants being factory options for many manufacturers and race teams. With all that said, it makes sense to take a look at their M1-110 Extended Performance Filter. The M1-110 Extended Performance filter is made to fit not just cars, but SUVs, ATVs, and bikes. The engineers at Mobil1 aimed not just on modern vehicles, but on older ones, as well, in order to give the older cars a boost in lubrication. 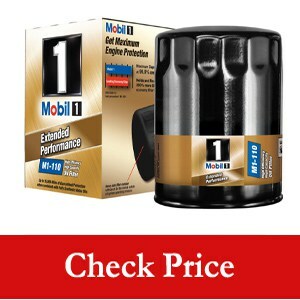 Mobil 1 says that their filter is ahead of the competition in terms of reducing contaminants that pass through the engine and that the oil picks up, holding up 28 grams of a total capacity of the filter. That’s double a number of other filters. What makes it do that is the use of synthetic fiber blend media. Dry starts are notorious for ruining your engine, so the M1-110 filter prevents draining of the engine oil to the sump, by using a silicone anti-drain valve. There is also no need to worry about over pressure, as the filter can withstand nine times the operational pressure. 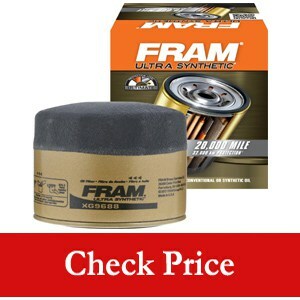 Another well-known brand when it comes to filters at least is FRAM. They’ve been around for years, proving their quality year after year, and doing it on a budget, as well. For our comparison and our search to find the best oil filter, we’ll be taking a look at the XG7317 Ultra Synthetic oil filter. The first thing you notice when you open the package of your freshly bought filter is that it has a textured top part. You may be amused by that, but there is a reason for that, and it’s not just for the looks. The textured part helps you tighten the filter with ease and no slipping. 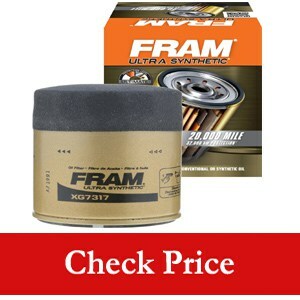 It’s something that FRAM calls Sure Grip and it’s a very practical feature, as it can be tough to tighten the filter when it’s all glossy and smooth metal. Engineers at FRAM also keep the engine from dry starts with the use of a long-life silicone anti-drain valve. On the inside, there are a synthetic blend media, that is backed up by a metal screen. That kind of structure gives you uniform pleating, durability, and optimum oil flow. It’s claimed that you can use the XG7317 Ultra Synthetic filter for up to 20000 miles without changing it and without an issue. It’ll keep your lubricated and run smooth as it should. Looking at the branding on the parts you have on your vehicle, you’re bound to have stumbled upon something that said BOSCH. It’s no wonder, as BOSCH is one of the top marks in the automotive world. Unlike Mobil 1, who focus solely on lubricants, BOSCH is present in all segments related to vehicles and they’re very respected by manufacturers. This time around, we’re focusing on oil filters, so we’re taking a peek at the 3323 Premium FILTECH. All manufacturers have their one technical solution to the internals of the filter, in order to give you the best overall performance. Oh, and they also need an excuse to call stuff names. BOSCH is no different with their FILTECH name, which is what they call the technology used for the internals. The innovative internal structure enables your engine to live a happy life because the FILTECH structure greatly reduces the contaminants in the oil. The casing is made of high-quality steel, so there is no warping, deformation or issues with leaks and poor seating. Another helpful thing as far as sealing goes is a high lubricity gasket, that enables you to have a tight seal, but at the same time, you can remove the filter freely. There is, of course, the mandatory silicone anti-drain valve, to help protect your engine from dry starts. At number four, we have another FRAM filter, this one is smaller compared to the XG7317. Being in the same XG series, the 9688 and 7317 have a lot of thing in common. It features the same Sure Grip system so you can mount it or take it off easy, as whatever tool you’re using will grip on the textured surface. There is also the same usage cycle of up to 20000 miles, so that’s a nice feature as well. The internals of the XG9688 are made in the same way as they are in the XG7317, so there’s no worry about the quality of the filter. As with all filters we’ve reviewed so far, it also features the silicone anti-drain plug, so there won’t be any metal grinding in your engine. The only two differences are that the XG9688 is made for daily driving and it’s smaller in size, compared to the XG7317. If we need to improve airflow in the intake, one of the best names in the industry is K&N. However, they’ve decided to apply their knowledge elsewhere, and expand their line of product by offering high flow oil filters. 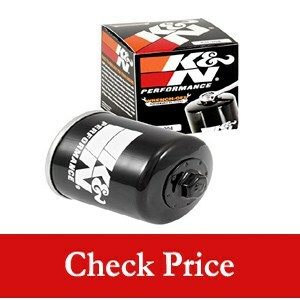 We think that there is no reason why we wouldn’t give the KN-204 Motorcycle/Powersports High-Performance Oil Filter a place in our list, so here is the verdict on it. Don’t be put off by the words motorcycle and Powersports, because this is an all-rounder filter. That means it fits both cars and motorcycles, and like the others, it fits a very wide range of vehicles. You can choose between the black and the silver model, but they both pack the same resin impregnated internals which gives you a claimed 99% removal of harmful components from your car’s oil. It also features a silicone anti-grain valve, to prevent dry starts. The heavy-duty casing will give you no problems when mounting it, as there will be no warping or deformation. Therefore, there won’t be any leaks present, since the filter will be seated as it should be. One of the good things about this filter is the exposed 17mm nut that’s on the top of the smooth housing. The cool thing about it is that you don’t need any special tool like you need to the others and it’s easy to mount or unmounts the filter. 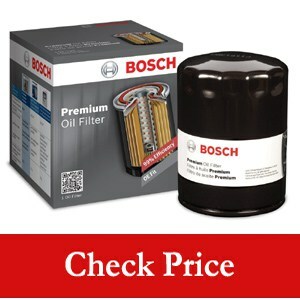 All of these filters are good options, it’s just a matter of picking the right one for your car. Also, keep in mind the type of driving you’re doing, as you’ll need to keep your engine fed with oil if it’s even a little bit spirited. But for daily drivers, unless you have a high capacity engine, any of these will do and the amount of money you intend to spend on an oil filter.